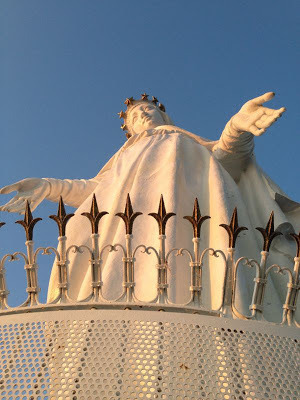 For the last four decades, Lebanon to me was the land where Kahlil Gibran was born , but a recent visit to Beirut showcased this fascinating country ,where two religions (60% Islam, 40% Christians) thrived together.They spoke Arabic, but with a smattering of French.The women were gorgeous and each one a fashionista- Beirut is called the Paris of the East. 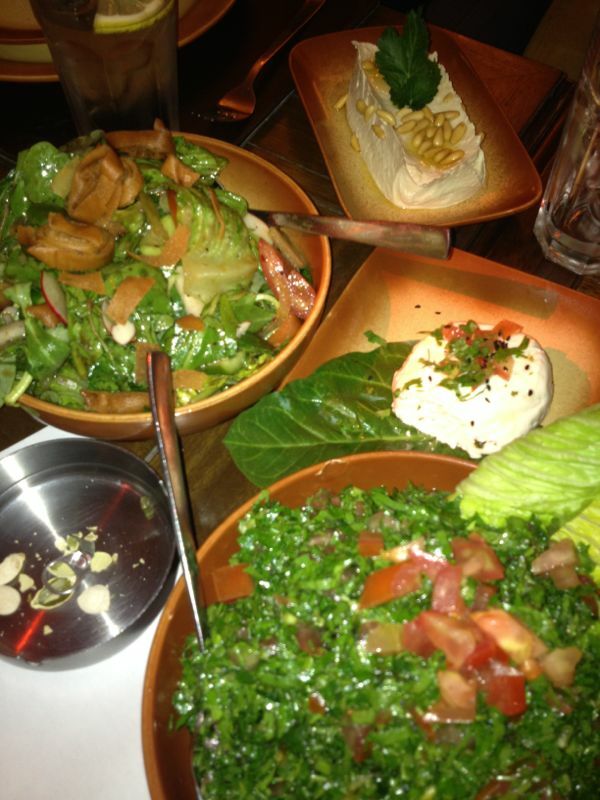 What left a lasting impression is the Lebanese cuisine- visually appealing and bursting with flavors yet light. 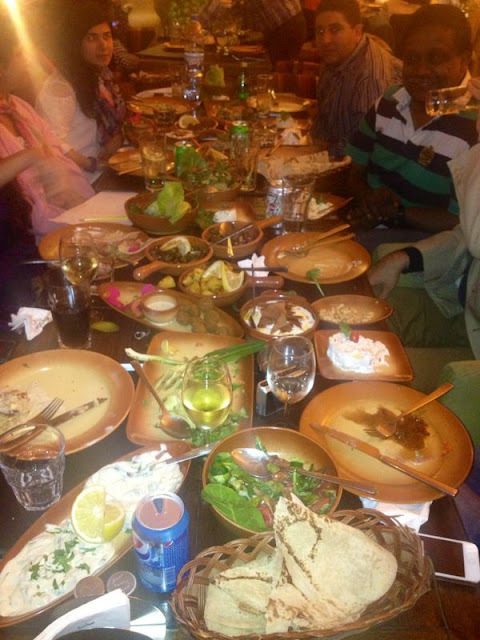 From salads to starters through main course to dessert, the Lebanese meze is "more than just food, it's a way of life' as said by Kamal Mouzawak, Beirut based food writer. 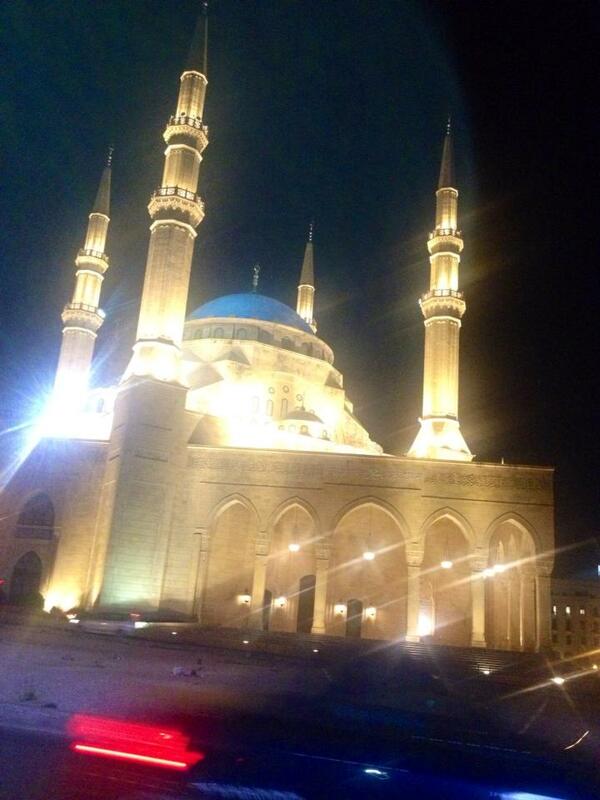 The blue mosque,Beirut. Lebanon has two predominant religions the Christianity and Islam and they live in harmony,just as both the churches and mosques glow into the Lebanese night. Meze, a mind boggling spread of dishes which owes its origin to the Ottoman empire. There are salads and cheeses, and meats, and desserts but at the heasrt of it is the idea of communal eating and large hearted hospitality. from top, clockwise:hummus,goat cheese(jebne beida),tabouleh, and fatoosh.All part of the elaborate Meze meal. 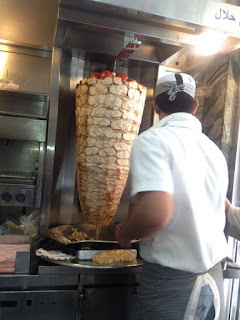 Mankoushe. light and flavourful, Lebanese cuisine is low on trans fats and high on fiber. The predominance of lime and olive oil, adds to the subtlety of their cuisine as well as shows the western and greek influence on the middle eastern palate.The cuisine of Lebanon is part of the Levantine cuisine. 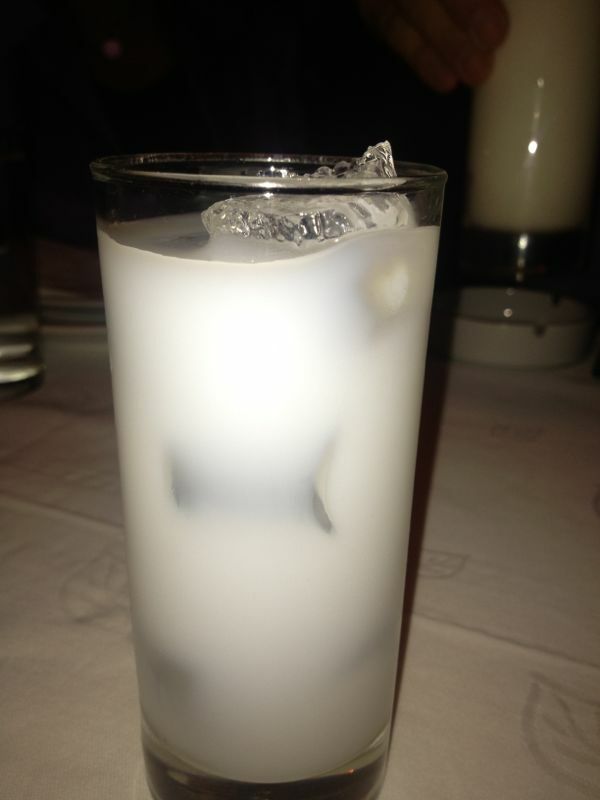 Arak, an alcoholic drink made of aniseseed. The concentrate is colourless, and on adding water , the aniseseed oil forms an emulsion with the water ,giving the drink a milky hue. Shawarma, the most well known of the Lebanese cuisine, enjoys its universal popularity, and yet it is actually a street food patronised as food on the move, and does not have the honour of being part of the Meze. 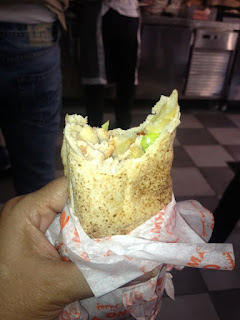 Having tasted shawarma in the beach side chowpatti of Goa, or the malls in Bombay, this was the chance to taste the authentic, and the proclaimed best in Shawarma at Manos in Beirut, Lebanon. 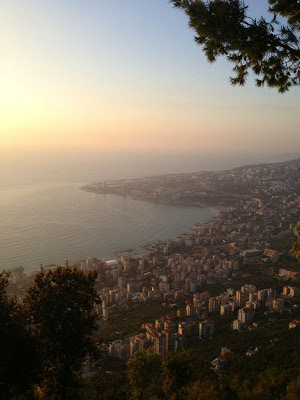 Lebanon and the Mediterranean sea. 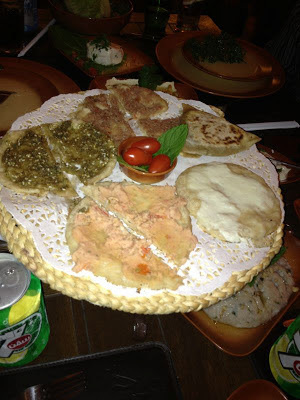 The Mediterranean sea, which gives the name to the Mediterranean cuisine, held much fascination prior to visiting Lebanon. 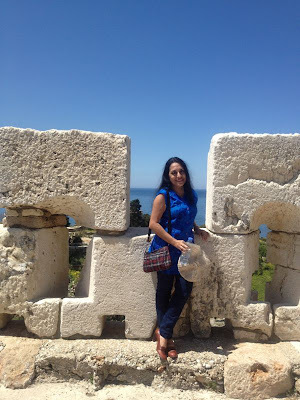 Once in Lebanon though, the people and places, the cuisine and the general warm hospitality of the people held central importance and the sea faded into the background. 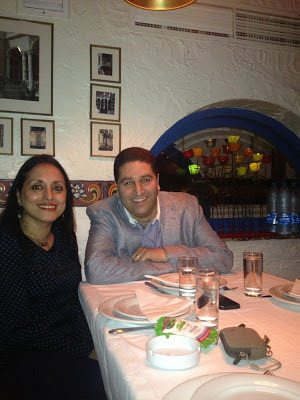 Whenever we speak of Lebanon or its cuisine, it generally gets generalised with Mediterranean countries and their cuisine. Lebanon gave me a deeper insight into the Mediterranean way of life and showed that even a small country has so much to offer. There are snow capped mountains and the sea, a rich cultural heritage and a vibrant night life, all this and more is Lebanon. 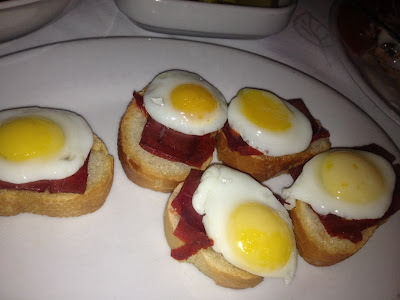 Bite sized eat, a slice of bread, with bastarma and toped with a quail egg. A mouthful of deliciousness! 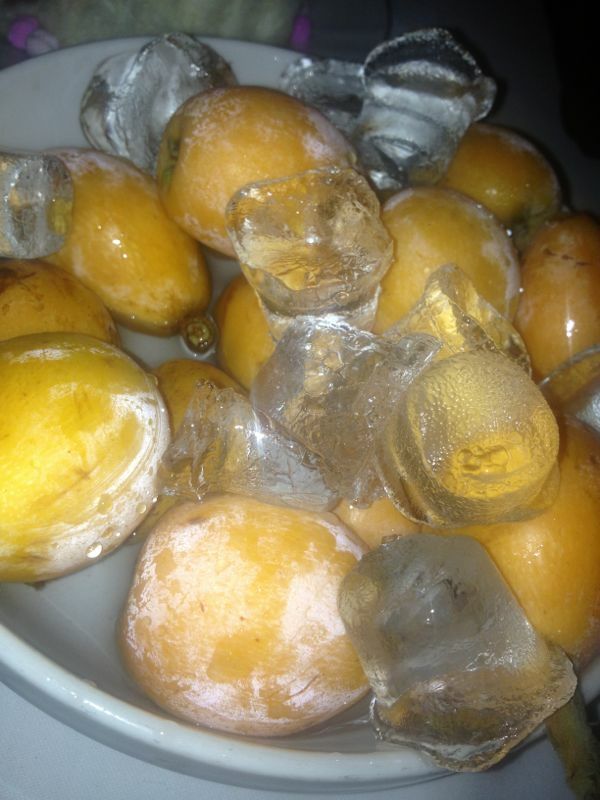 A bowl filled with ice cubes and akki deni. A delicious fruit , which tastes like a cross between the apple, pear and a mango. chilled fruit, a great way to end the Meze. 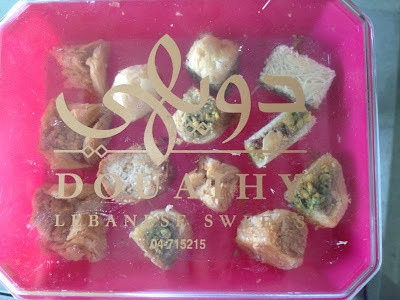 Baklava, a dessert almost synonymous with the region, made famous by the number of food channels, and George calombaris of Masterchef Australia. great to eat and great to take back as gifts for friends and family. 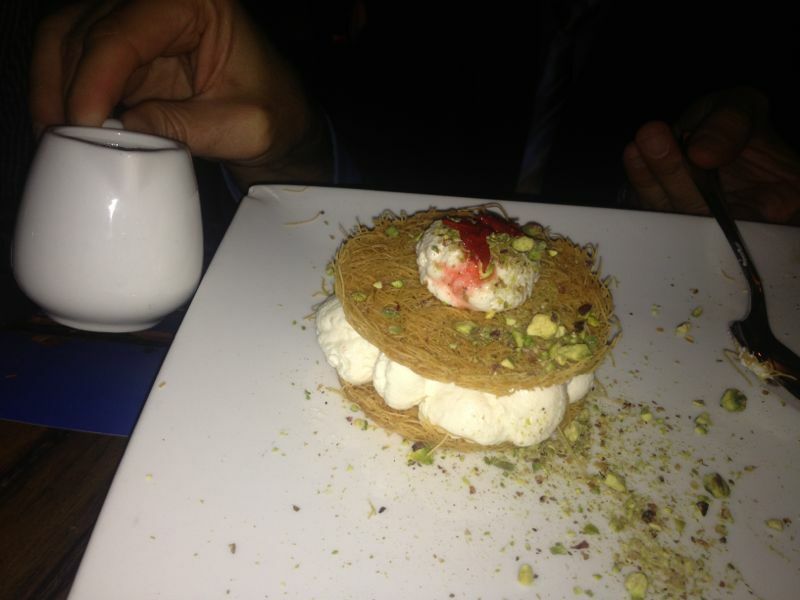 unsweetened cream sandwiched between two deep fried pastry sheets, sprinkled with pistachio, is first drenched in sugar syrup and then enjoyed as a sinful dessert. 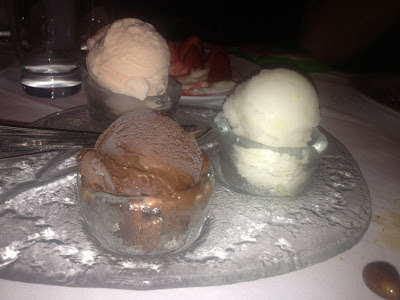 Icecreams served in bowls made of ice. The Lebanese sure no how to serve their desserts in style. 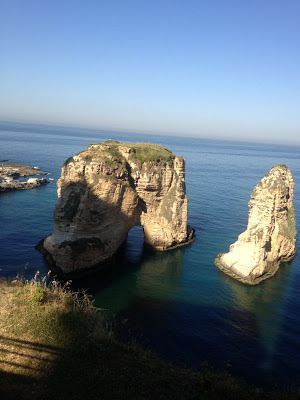 Lebanon, has so much to see and experience in terms of natural beauty, the sea scapes, the ruins of Byblos (Jubayl ), and last but not the least the Jeita Grotto. The Jeita Grotto, is beautiful and awe inspiring beyond words. 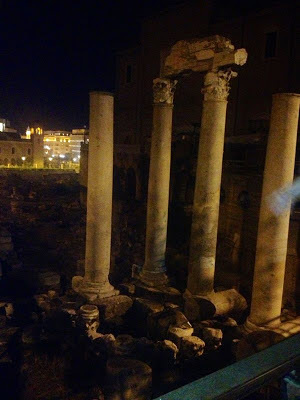 You must see it to believe it, and unfortunately photography was not allowed.It seems as if one is in a 3 D movie, so unreal is the beauty of the place. This natural wonder was considered for the wonders of the world but lost out to its better known counterparts. Nevertheless it inspires wonder. Fadi, our host in Lebanon. Thankyou for your hospitality. 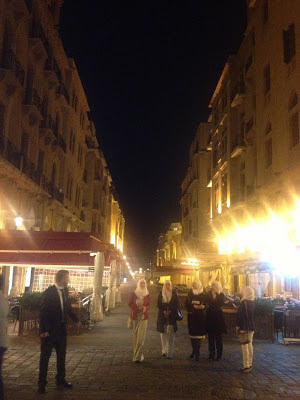 Lebanese women in their head scarves roaming the streets at 1 o clock at night. 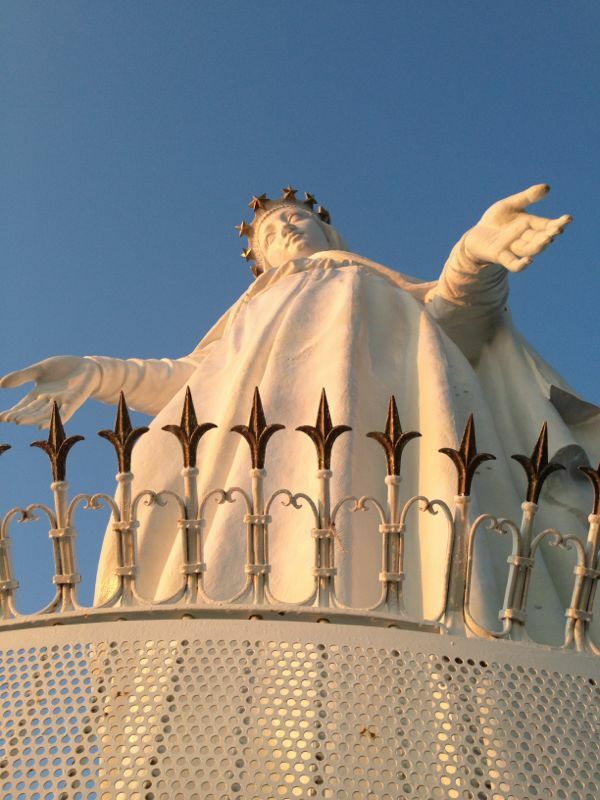 The Lebanese women are beautiful and passionate and live a complete and full life. They drive SUV cars, dress in the latest in fashion, and are not afraid to show their absolute love for their country and culture. Food trail :Lebanon as seen through the eyes of Barnali Bhattacharya, with expert inputs from Nada Nehme. Mereelle Jabbour, Barnali Bhattacharya and Nada Nehme. Having travelled from Mumbai, to HongKong, and then ferrying across to Mainland China into Shenzhen, we were ravenous when we got there, lucky for us the comforting double boiled soup awaited us. Sushi, a distinctive Japanese dish, but I just loved the colourful detailing in these dishes.Shenzhen was a fishing village,untill 30 years back.And the enormous number of sea food both raw and cooked were mind boggling. When we decided on going to China, I hadmade up my mind of eating,or atleast attempting to eat a snake.Shenzhen incidentally had many a snake market to boast of , but they were all closed for the two days that we were visiting. I settled on the next best exotic food item I could find- Sea weeds! If you dont think of them as sea weeds they could pass of as some kind of fishy smelling spinach, served up with sliced octopus tentacles if you please. The chinese are immensely fond of their steamed dumplings. They can be found on pavements to five star buffets.They are served for breakfast ,lunch and dinner. The chinese noodle soup.I am a huge fan of the noodle soup, be it the Thukpa, or Thai Khao Sui or Laksa, or plan old Maggi noodle soups, so having the oppotunity to have an authentic chinese noodle soup IN China itself was super exciting.There was one catch though, the chef knew not a word of english! I mimed my way to what I hoped was an edible rendition. You see there were 5 types of broth to choose from, I am guessing they were chicken/beef/pork/prawn... but I couldnt be sure,so I pointed at the one which looked appetising. Then there were many types of meat balls and vegetables, not to mention at least ten types of noodles to choose from. I pointed at random, and the chef kept dropping them in the broth, and to my great relief- the soupy noodles was FANTASTIC. No matter what part of the world you travel, sugar speaks a universal language. This Yin and Yang dessert spoke the language of chocolate,my favourite kind of language. Chinese handicrafts of stuffed baby dragons in colourful colours. A picture from a moving vehicle, of the chinese flag against a backdrop of high rises. Shenzhen was a small fishing village, just 30 years back,when the Chinese government decided to make it a port of importance and today it has an economy better than the neighboring Hong Kong. It boasts of expensive malls,multinational companies, and a tourism hotspot.All in just 3 decades. Its phenomenal. Shenzhen provides jobs to millions of immigrant chinese people who come here for work, and thus this makes of a rich cultural melting pot.China loves its red and gold, which is depicted in it's flag as well. A colour so synonymous to china that even the Chinese restaurants in India bear these colours. Note the bonsaii trees along the miniature GREAT WALL OF CHINA, at Splendid China , Shenzhen. Road side eateries. No one knows english and all the hoardings are in chinese. If you wish to eat, just point at the illustrated menu. windows of the world.If there is just one place to visit in Shenzhen , then this is it! This is where you get to see how good the Chinese can replicate original things. They have replicated every wonder of the world, and a perfect replica of the Eiffel tower with its own lift which take you to the top. In this Eiffel tower, instead of a view of Paris, you can see the Pyramids to your left, and mount rushmore and the niagara falls to your right, and the Taj mahal and the Colosseum in the distance. 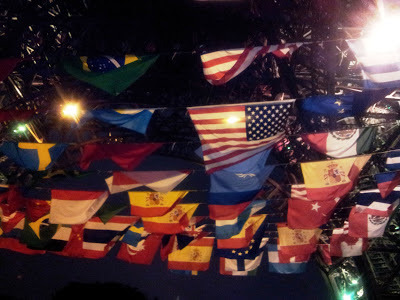 The flags of the countries represented in the Window of the world. Chinese Fast food, interesting tastes , more interesting names. The fast food joint outside Windows of the world, The chinese version of a Mac Donald. a fantastic wonton soup at the fast food place outside Windows of the world. We had no idea what to order.We decided to order what the rest of the Chinese customers in the shop were having and our gamble paid of. The night show at the Windows of the World is a must see , with dances depicted from various countries. A large part of the Dances were Russian though, in loving memory of the chinese comrades. Breakfast in China is a mind boggling experience,simply because a lot of the lunch and dinner items show up at breakfast too, like rice.Lucky for me the inflight magazine on my flight into Hongkong had adviced me to try the Congee.Congee is a rice porridge, which has many avatars of it across the globe, but I guess its only in China that you can dress your porridge up in bits of ham,dried fish,chicken and peanuts. These Mandarin sweet oranges were the absolute find of the trip. I could easily hold three to four oranges in my palm, they were so tiny,and each bite was deliciously sweet. We couldnt get over them, and even when the banquet boasted 50 types of food preparations, the bowl of mandarin oranges were the first to finish. All the assorted things to accessorise your congee with. The Congee itself were of three types. The plain, the salted pumpkin, and the egg congee. Youtiao, or fried dough, best had dipped in a bowl of congee. Mathew ,the Executive Chef of the Zen at Futian Shangrila, was an immense help, and provided the Americans take on Chinese cuisine. A glimpse of China in my two day visit to China, and it leaves me wanting to know more about this land of rich culinary history, the varied flavours of the unique cuisine, but above all it shows the respect that the Chinese have of their age old traditions, and a love of simple comfort food, be it in the medicinal double boiled soup, the various steamed dumplings, or the wholesome congee.